Masham is situated at the head of Wensleydale between Ripon, Bedale, Leyburn and Richmond, amidst some of England’s most glorious countryside. Harrogate and Darlington are 40 minutes’ drive, while Leeds, York, Newcastle and Teesside are all about an hour. From the A1(M) (northbound); exit at Junction 50 (A61). At exit roundabout take second exit (A 6055) for 3 miles, then turn left at roundabout onto B6267. Masham is 7 mile further and well signposted. From the A1 (southbound); exit at junction 51 and follow signs for Bedale (A 684). At the Bedale crossroads carry straight on. 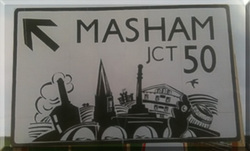 Masham is signposted and is a further 6 miles. The nearest mainline railway stations are Thirsk and Northallerton. By Road from East: Coming into Masham on the A6108, come over the River Ure bridge, then turn left up Silver Street and left again just before the Market Square (opposite the Bay Horse pub). The Town Hall is directly in front of you. By Road from West: Coming from Leyburn / Middleham on the A6108, turn right immediately after the Co-operative store onto Silver Street, then as above.